To make the process quick, I used my instant pot, but this recipe can be prepared on regular stove top method also. I have explained that as well below. Also, I used store-bought curry powder. 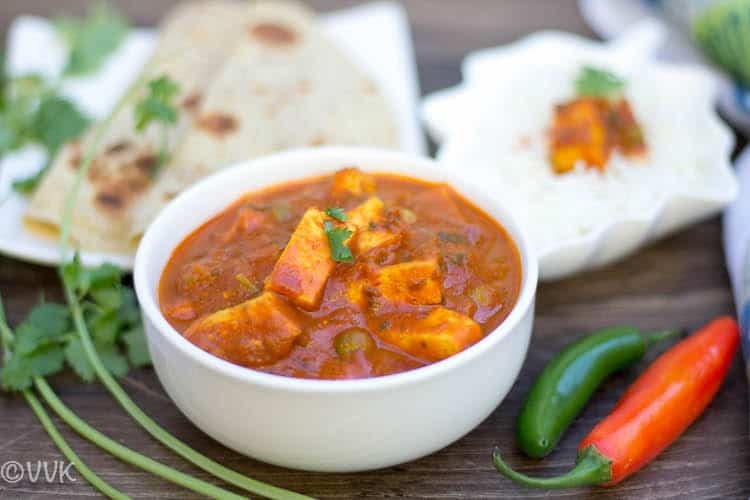 You can replace that with coriander powder + chili powder combo, or you can use any other store bought paneer masalas like shahi paneer masala or paneer tikka masala. You can play with your favorite flavors here. I usually try the recipe twice or thrice before posting on the blog. But this recipe is here, right after the first attempt. Because the recipe passed with distinction and it came out with flying colors. Wondering, who judged this recipe, of course, my dear vaandu. 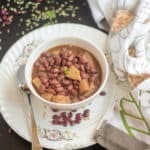 I was not planning on to clicks pictures and post this recipe. I did not even take the step by step pics. After preparing, I served this to vaandu, and he was blown away by the flavor and taste. He asked for second servings, and he enjoyed this a lot. And then he asked me why I did not take pictures. I was oscillating if I should click or not and finally clicked it. I know I could have done a better job with the photos. I will get back to this recipe soon and update it with the step-wise pictures and also the featured ones. 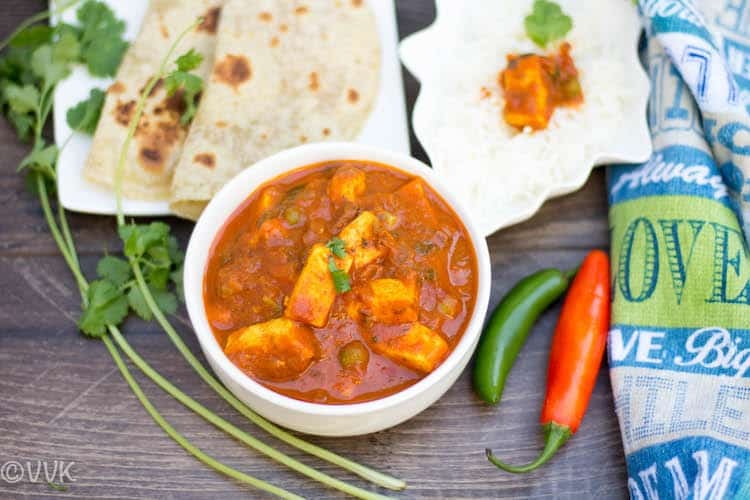 Cut the paneer and onion and set aside. Set the IP in saute mode. Once the IP is hot, add the oil and cumin seeds. Let the cumin seeds crackle and then add the chopped onions and saute until it turns translucent. Then add the pasta sauce, turmeric powder, curry powder, sugar, salt, chopped paneer, and peas if using. Mix them well and add water. Close the IP lid and set it manual mode for 3 minutes. Once the IP beeps, let it sit for 2 minutes and release the pressure quickly and carefully. Mix the gravy nicely and then set the IP back to saute mode. Now add the milk, crushed kasoori methi, and the chopped cilantro. 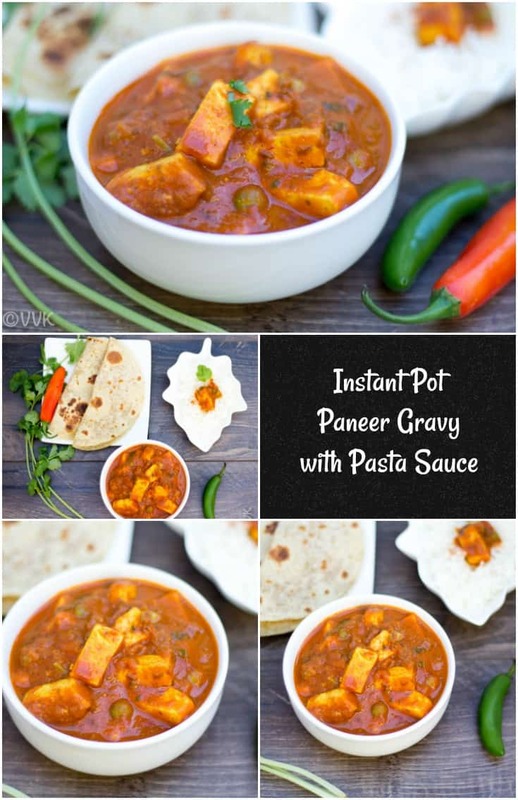 Instant Pot Paneer gravy is ready. 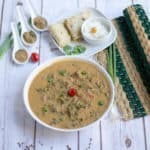 Serve hot with rice and roti. Once the oil is hot, add the cumin seeds. Let this simmer for about 7 minutes. Keep stirring the mix for every two minutes. 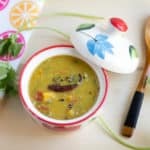 Once the gravy has thickened, add the milk, crushed kasoori methi, and the chopped cilantro. The Paneer gravy with pasta sauce is ready. 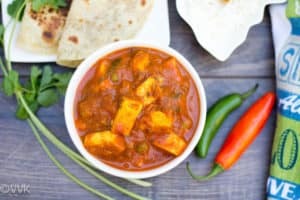 Instead of curry powder, you can use coriander powder + chili powder combo or shahi paneer masala or paneer tikka masala mix. Instead of regular milk, you can add fresh cream. For this recipe, I used pasta sauce with no added veggies. It’s just the basil flavored pasta sauce. You can use pizza sauce or any other flavored pasta sauce. Then add the pasta sauce, turmeric powder, curry powder, sugar, salt, chopped paneer, andpeas if using. This recipe is great for students who has very less time on their hand, nice one! 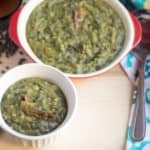 Hmm… Love instant pot dishes and this one is definitely a keeper! This is different and easy to make. Looks tasty Vidya. 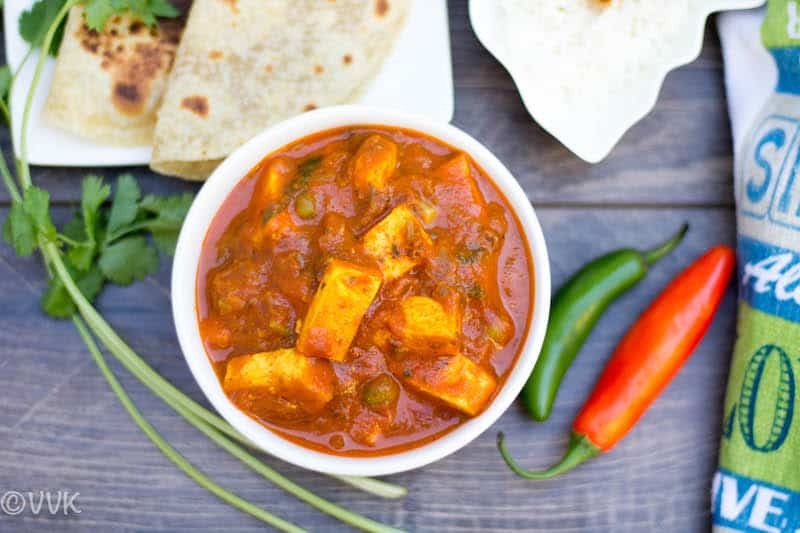 Paneer is my favorite vegetarian protein. This gravy looks so creamy and delicious. Will try it soon. Thanks. Please do let me know how you liked it. Easy and delicious recipe. I will make these with vegan options. Thanks Uma. Yeah I need to try the vegan version too. My 5 year old loves to eat paneer. I will try your recipe. Thanks Aish. Please do try. Thanks a lot Sudha. Glad you liked it. :-) Your comment made my day. 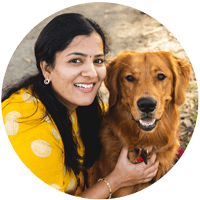 Hi Vidya, I have nominated you for the award of Awesome Blogger. Congratulations! 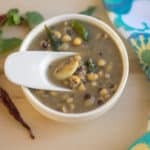 Visit the post https://wordpress.com/post/chitrasrecipes.wordpress.com/5326 for more details. Hope you do your nominations as well, even if you don’t it’s fine. Thanks. Will do it soon.